Peninsula Peace and Justice Center has long been regarded as the leading grassroots activist organization on the San Francisco Peninsula. That reputation is due in large part to the leadership of Paul George. Paul started work at PPJC in April 1989. He will be retiring in April of this year. 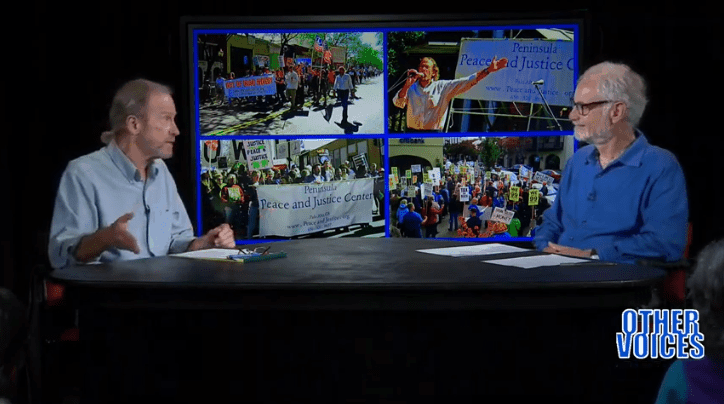 For this Special Edition of Other Voices TV, Paul talked about his tenure at PPJC, his other activist experiences, and his thoughts about grassroots activism past, present, and future. Paul George got his start in grassroots organizing when he was just 16 years old, volunteering as a youth organizer for the Eugene McCarthy for President campaign in 1968. Since then he has served as West Coast Organizer for the Nicaragua solidarity organization Quest for Peace, community organizer for Health Care Workers Local 250, fundraiser for the California single payer health care ballot measure, plus his 30 years at PPJC. Paul has traveled to war zones in El Salvador and Nicaragua in the course of his Central America solidarity work. He has been arrested nearly a dozen times in non-violent civil disobedience on issues ranging from nuclear weapons to US intervention in Central America to health care and labor issues. Paul is a frequent public speaker on a wide range of progressive issues, and has hosted community radio and television programs for the past 25+ years. During his time with PPJC Paul has organized dozens of protest marches and rallies, including the historic anti-war rally in February 2003 in opposition to the coming invasion of Iraq. That rally, which drew over 5,000 people to Palo Alto City Hall, still holds the record as the largest protest in the history of the Peninsula (according to the Palo Alto Weekly). In his public addresses, Paul emphasizes the importance of knowing and learning from the history of activist movements and the many victories achieved through the hard and determined work of grassroots efforts. After 50-plus years as an activist, Paul is a part of that history and he has some stories to share with us. Elliot Margolies has produced and facilitated community-focused media in the Silicon Valley since 1984. He was the founding Executive Director, in 1990, of the Midpeninsula Community Media Center in Palo Alto. Margolies has helped over three hundred Midpeninsula nonprofit organizations, government agencies, schools, and community groups to produce video programs. PPJC’s award-winning Other Voices TV is a direct result of his work. Elliot currently works as Strategic Initiatives Director for the Media Center writing grants, managing projects, and coordinating web strategies. This entry was posted in Events, Videos and tagged activism, paul george, video by PPJC Admin2. Bookmark the permalink.